The ancient Greeks told myths about human sacrifice, but did they really kill people as some sort of sinister sacrifice to the gods? 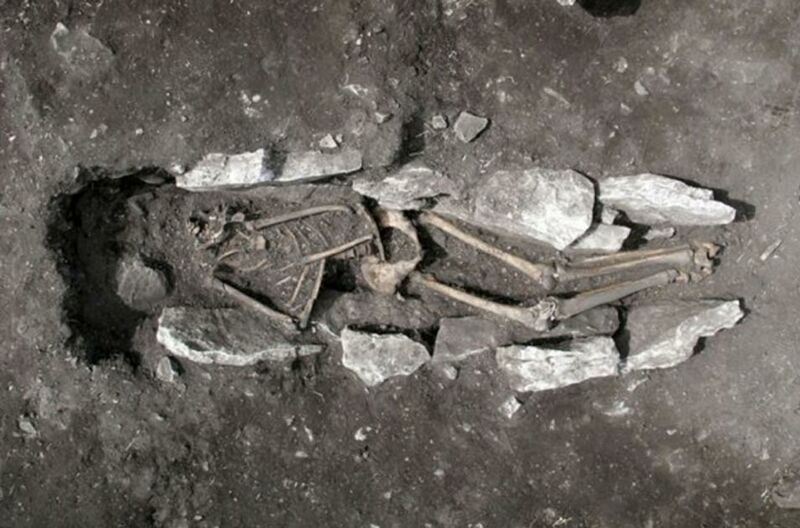 The 3,000-year-old skeleton of a teenage boy discovered in a mound of ashes of animals sacrificed to the gods indicates some of them may have. Archaeologists excavating this summer discovered the boy’s remains on an ash altar next to a stone platform on Mount Lykaion in Arcadia of the southern Peloponnese. For about 1,000 years before he was killed, Greeks sacrificed animals there. Though no other human remains have been found in the ash mound, just 7 percent of it has been excavated so far, reports the Associated Press. The ash mound is 100 feet (30 meters) in diameter and 4.9 feet (1.5 meters) high. The upper part of the boy’s skull was missing, and whoever placed the body there interred it between two lines of stones on an east-west orientation. Stone slabs covered his pelvic area. The research team says it’s too early to say how the boy died. Ancient writers said there was human sacrifice at Mount Lykaion, which was associated with Greek cults for centuries. The practice of human sacrifice has been only rarely found by archaeologists working in the ruins of the ancient Greeks and never on the Greek mainland, AP states. Lycaon was mythical king of Arcadia who was said “to have sacrificed a child to Zeus on the altar he had raised on the highest peak of the mountain (Lykaion), on account of which he was changed into a wolf,” says The Dictionary of Classical Mythology, Religion, Literature and Art. There was another legend that Lycaon had 50 impious sons. Zeus visited their home in the guise of a beggar or humble workman to test their contempt. A variant of the story says Zeus spared Lycaon but killed his children after they offered him Nyctimus’ remains in a soup. “Some scholars believe that the myth is related to the cannibalism that was a part of the cult of Zeus Lycaeus, in which it was believed that those who ate human flesh were turned into wolves and wandered in the wild for eight or ten years before being able to return to human form—and then only if they did not eat any more human flesh,” says The Facts on File Encyclopedia of World Mythology and Legend. The Mount Lykaion Excavation and Survey Project site, online here , states: “In the ancient Greek region of Arcadia in the southern Peloponnesos, the sanctuary of Zeus on Mt. Lykaion stands out for its great fame, mysterious rituals and wide-ranging significance. “The earth of the altar contained burnt stones, many small animal bones, tiny fragments ofand 4th century BC pottery, iron knives, clay figures, coins from Aegina, a clay figure of a bird, and two small bronze tripods. Kourouniotes found no evidence of human bones, only animal bones (mostly cow and pig). The AP says the mountain was inhabited for about 5,000 years, though it is unknown how long the adherents of Zeus sacrificed to the Greek supreme being there. No one knows why anyone would be on the barren mountain if not for the purpose of cultic sacrifice, though.